The Knife Collector by Jesse Breite. FutureCycle Press 2013. 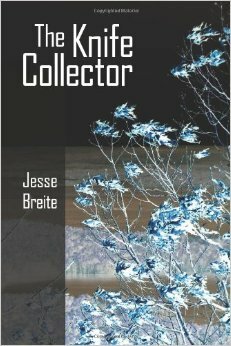 In The Knife Collector, Jesse Breite’s first chapbook, readers are engaged in a not so pleasant world of failures, misunderstanding, and diminishment through dependency. If there were two phrases from the poems to set the mood, they would be “wild grit” (from Animal) and “hard guilt” (from The Diamond State). Through individual poems and collectively we are introduced to a sad family: a father who understands knives: “He spits and says, Keep this here fine/and you won’t even feel it go through”, pistols, Budweiser, “alcoholic demand”, and river fishing, a mother without support or answers, a sister fighting (and losing) a battle with drugs, and friends in and out of trouble. The Arkansas setting is just as diminished and unflattering: “Arkansas is patiently inescapable,” “…but panning through Arkansas dirt…” a section of Little Rock called “Hell’s Half Acre”, “the trailer-burbs of tooth-rot…” and “You feel every slab/of the highway—you/spine-guilty Arkansawyer”. Most of the animals we meet come to us as images of predator (hawk “The sharp-eyed king takes to flight–/from its needled claws, illegible shrieking.” and wolf, “Her teeth strike, the flash of knives turning/into flesh…”) or prey (mouse, snake, and possum as road kill). The words “rust” and “blood” frequent many of the lines. The poet brings energy in his verbs…”truck grumbles,” “trees lob,” “I tong sticky flesh,” “trains riddle through,” “(finger) nails shovel through her body until it spurts blossoms,” and “eyes…glowering.” Equally strong and hard are similes and metaphors: (on starting a new life after a divorce) “tilling her fields after a dead season,” “sobered from a jail cell,” (describing a raccoon) “wearing stale fur like an unwashed dress,” “feral nonchalance,” “crucifix-face,” and “smoked (cigarette) butts dead as bullet shells on stone”. His poems are stories, full of detail and reflection; occasionally the story will end when the specificity of the image is expanded into a more universal consideration. In Easter Morning the poet observes “a mother possum and her babies/strung across the curb as the high-velocity dead,” but he finishes the poem with, “I slow to a walk, recall/the body, and hear a voiceless stirring/in a wood beside the road.” In The Cardinal, a bird dangerously thumping against a window reflection of itself is symbol of a daughter who loses a job and disappears for a time in anger or depression. In my favorite poem, “Fishing in the Dark”, words, writing, perhaps poetry (“Language is a fickle thing.”) grows out from the experience of fishing in the night where, “Even then, what’s strung snags on/what’s available…” Occasionally the writer’s figurative language wanders far enough to confuse rather than illuminate: in Calumet Ritual, Little Rock 1997 …“Common spirit/spidered down through instinct/rooting us…” and in The Centurion “…Retrospection settles into a skin-full dust.” One will not feel bright, cheery, or hopeful after reading The Knife Collector. Jesse Breite portrays a world we would not want to be too close to, but he does it artfully, with eyes wide open, and occasionally with a hint of grace and wonder. Fred Kreutz is a lifelong educator and learner, a retired school administrator, a semi-retired English instructor, a creative photographer/artist, an inhibited self-promoter, and an unsung poet and writer.